Have you heard of vertical gardening or vertical farming? Space for gardening, farming and growing food crops is increasingly encroaching upon natural eco-systems as urban centres become more dense and sprawling. Some countries have very little productive area for agriculture due to water and climatic restrictions. Scientists are realising the costs of intensive farming on our environment that include polluted water and eco-systems, soil infertility, reduced crop resistance to disease and pests and less nutritional value from food itself. Let’s explore a little more about vertical farming and what it is all about. According to Dr. Dickson Despommier, who is considered one of the world’s foremost experts on vertical farms, our children and grandchildrens’ generations could be soon facing a worldwide food crisis if changes are not made to the current manner in which we farm and grow our food. By 2060 he says that 3 billion people could be facing starvation due to the declining global food supply. In his book, The Vertical Farm, Despommier, rallies the cause for the use of vertical farms, which could enable every country in the world, regardless of climate or agricultural land, to be able to grow food in an efficient and sustainable manner. Imagine towering skycrapers, designed and built solely for the production of food crops. Glass pyramids and towers that allow as much sunlight in as possible are then intended as complete ecosystems, capable of producing even fish and poultry while reusing internal waste, these amazing structures could be built in every large town or city, providing all the fresh food their inhabitants need, cutting out the import and export of foodstuffs across the globe, dramatically making food a more sustainable enterprise. Despommier believes that current technology and the relatively new methods of greenhouse food production as well as vertical gardening, made famous by the green wall pioneer, Patrick Blanc, could and should be fused in an up-scaled design, where food can be grown year-round, despite the season, in an ecologically sound manner, where organic principles are applied together with cutting edge technology that will deliver food in a cheaper and more sustainable manner. Vertical farming: where to from here? The immediate opportunity may simply be to take advantage of the space available on urban rooftops, says Mr Head, and to pursue urban farming rather than vertical farming. Rooftop gardening is already a common sight in cities and towns around the world, especially in Europe. South Africa has yet to catch on in a big way, as currently the costs of converting roofs into strong enough structures to support the large weight of the needed soil, outweighs the savings of the food costs. Most of the lightweight materials needed for irrigation and for making the soil as light as possible are still rather expensive and make buying a packet of salad at Woolies rather cheaper. But hopefully this will change in time and soon we may even see supermarkets with their own roof gardens or vertical farms, farming on the roof, where you can buy organic, just-picked food straight from your favourite store. 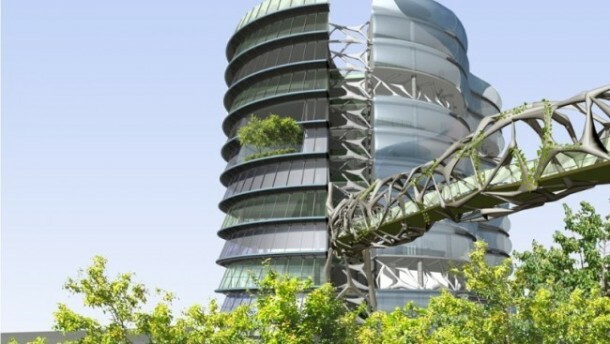 Currently, the vertical farm is more a theoretical idea with very few in reality around the world, but if properly designed, executed and maintained, and with more thought given to the issue of increasing the natural light needed and their energy requirements, then we may just see these incredible structures in our future soon. Check out these amazing designs that have been done for vertical farming by architects and engineers, horticulturists and farmers around the world.